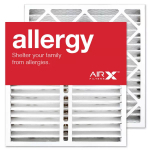 If you want to protect yourself and your family from allergens that irritate your lungs, this is the filter for you! You'll have a hard time finding this filter at the local "big box store." We make things easy and ship directly to your front door. Actual Dimensions 19-5/8" x 19-7/8" x 4-3/8"